“The problem of marihuana is a relatively new one. Yet it is so serious as to require immediate attention and control. No doubt you have read news stories in Wisconsin newspapers relative to the use and growth of the drug called marihuana. No doubt you have also heard of arrests which have recently been made in a few places in this state. In Milwaukee, in particular, such publicity has recently been given this subject. “There are those who feel that [**ce] the use of marihuana has not reached large proportions in Wisconsin it would be best not to do to much talking about it for fear that its discussion might cause inquisitive people to want to try it and thus acquire the habit. These same people feel that too much publicity might be suggestive to children who might be interested in experiencing a thrill which eventually might grow into a habit developing into a life of crime. “I am not going to discuss this problem as an alarmist or talk about it just for the sake of talking. I do believe, however, in the efficacy of the old proverb that ‘an ounce of cure’. From the standpoint of the control of crime there is a problem here which we must face and observe. We should not lose our eyes or stick our heads in the sand like an ostrich. I feel that we that we should give this problem of the control of this drug considerate attention before, rather than after, it has been extensively used. “Our approach to the whole general problem of the control of crime in this age in not that of how we can punish those who have committed a crime, but rather how we can educate against and in this manner prevent those who might commit a crime. With this approach, I think it is well that educators and parents in particular should be informed that they may be on the alert, particularly to protect the younger generation. “We cannot say that this problem is not with us. In the city of Milwaukee alone more than 60 arrests have been made for rimes which have been traced to the use of marihuana. Federal agents, cooperating with local authorities in several places, have uncovered the activities of people who have definitely trafficked by rising and selling the drug in the form of cigarettes. “In those states where the plant from which marihuana is harvested is not or cannot be grown, the control of the problem is quite simple. In those states where marihuana is grown in large quanities we must expect to have a more serious problem. Wisconsin should be vitally interested, because it is in this section of our country --- Wisconsin, Minnesota, Iowa and Illinois --- that the largest quantities of the plant are grown. “The plant from which marihuana is produced is a species of the Indian hemp family. It has been grown in this section of the country principally as a raw material from which rope is manufactured. When it is grown for that purpose, however, it is harvested long before it reaches a stage of maturity which will produce marihuana. It is harvested before the seed matures, and under such circumstances no drug can be produced. On the other hand, if the plant is permitted to mature to the stage of producing a seed, then marihuana can be harvested from it. The seed when ripened is often used for the feeding of birds, but there is little cultivation of the plant for this purpose. The principal growth, as I have stated, is for the production of raw material for the manufacture of rope. “It is evident, therefore, that if Wisconsin is one of the large producers of hemp, there should be a way of controlling this production to the end that we may be assured that it is used for legitimate purposes. If law enforcing agencies are to cope with the problem of marihuana, there should be some method to control the growing of the plant. We do not have to attempt to eliminate the growth of the hemp plant which is used for the production of raw material for rope, but we should stop the growth of this plant by those who cultivated it for any wrongful purpose. Thus, we can require those who cultivate the plant for commercial purposes to obtain permits and to be registered so that they can be checked and supervised. The cultivation of it for any other purpose can be prohibited by law. And when found growing promiscuously along railroad right-of-ways, highways or uncultivated fields or city lots, it can be treated as a noxious weed. Then, like the thistle and similar weeds, it can be destroyed before maturity by those whom the low holds responsible to perform such duty. “In 1935, Wisconsin, through the action of the legislature, adopted the uniform narcotics law and this act included a prohibition against marihuana. Although recently enacted, this law already needs to *** amended for the reason that when it was adopted it was generally believed that only a certain type of the hemp plant yielded marihuana. The present Wisconsin law prohibits only the product of the pistillate or seed bearing plant. We have now discovered that this in not the only one from which marihuana can be produced. In other states enforcement officials have already experienced set-backs at the hands of those who would make prompt use of the unintentional loophole in the uniform law. “The Interstate Commission on Crime, of which I am a member, of its national convention, has advocated the adoption of uniform laws and co-operation by the states for a more effective control of this drug. Twenty-nine states have already adopted the uniform law and two other states have adopted laws quite comparable. “The federal government has also gone into action and enacted federal laws which impose certain taxes on the production, manufacture, and sale of marihuana. While such a law is an internal revenue measure, the indirect result of its enforcement tends to limit the use of this drug to medicinal purposes. “The federal government has a force of agents who are now actively suppressing the interstate traffic in the drug. It remains for the states, however, to take care of that part of the problem which is not interstate in character. For this reason, I believe it is important for us as citizens of a sovereign state to recognize this problem and support such a legislative program as may be necessary to enable our law enforcement agencies to effectively control the traffic and use of marihuana within our state. “Ten years ago there was little traffic in the drug except in New Mexico and our southwestern states. The development of the traffic in the drug during the past few years has been quite rapid. This has been particularly true since the demise of prohibition. It seems that some now look to it as a new source of increasing their illegitimate revenues. Mexicans, Philippinos, Latin Americans and similar nationalities were the first to become interested in the use of marihuana. In most instances they plant the seed in open lots, where it grows without the need of cultivation. Then under the cover of darkness, the seed is harvested and dried, and dried, and its leaves are made into cigarettes in a form which encourages its sale. “The smoking of a marihuana cigarette may have a variation in its effect upon an individual. There is one almost universal reaction, however, and that is the loss of restraint. There may be no obvious indications that he is under the effects, yet he may not be able to refrain from following suggestions from others or following some unusual quick of his brain. Often smoking at first produces a feeling of hilarity. This feeling is followed by a laughing sensation. Following this, there may be a stupor which causes the user to commit horrible crimes, not only on strangers, but on members of his own family. Instances have been known where users have killed their dearest relatives and later failed to recall that they had done so. A prolonged use of the drug produces a mental deterioration which means ultimate incarceration in an asylum if they are not first committed to a prison. “Probable the greatest danger is the fact that one may lose his self restraint after smoking only one such cigarette. Thus, people unfamiliar with it, and particularly school children, may be drawn in without a realization of the possible dangers. Investigations show that school children have been approached in many of our large cities and some in our own state. It is not a hard matter to prevail upon them in try, and thus later put them on the list as regular customers. “The alarming spread of the use of marihuana and its sale to children has been instrumental in arousing parents and those interested in protecting our youth to take some action. They have begun to realize that only through a campaign of education conducted in every community can we bring to our citizens the importance of eradicating the use of this drug. Special knowledge of the weed, how it grows, what it looks like, should be available to everyone, and local authorities should know that it should be destroyed before it reaches maturity. “Although the use of marihuana as a narcotic intoxicant has only recently become a matter of concern, the extent of its use and the reason for its spread is a matter of conjecture. Morphine, cocaine and other drugs addicts have turned to marihuana. This no doubt, is due to the federal government’s increasingly successful campaign against the traffic in such drugs. Morphine and cocaine produced in foreign countries are so well under federal control that they can be illegally sold only when smuggled into the country. “The deplorable fact with respect to the use of marihuana is that police records show that a new class of users is being developed. Whereas the statistics show that white drug users are over 30 years of age, the user of marihuana is considerable younger. The curiosity, recklessness, and lack of information on the part of younger people aided by the persistent avarice of the peddlers, has been a contributing factor in the sudden popularity of marihuana among younger people. Morphine and cocaine as drugs are expensive. The cheapness of marihuana is another contributing factor to its use. Since the peddler can retail marihuana cigarettes for as little as 5 and 10 cents, younger people are not deterred from buying for lack of funds. The cheapness of marihuana is due, of course, to the availability of the supply, the easy method by which it can be sold or distributed, and the present lack of an effective control. “The effect of the use of marihuana on the individual in his connection with society is a matter of police record. It is true, of course, that in some cases the drug is only a contributing factor and not the direct cause of the crime. It is widely used to bolster up the courage of members of the underworld. It thus enables them to commit contemplated crimes for it give them the illusion of an increased physical strength. There are many instances where marihuana has been more than an adjunct to a criminal act. In fat, in many cases it has been directly responsible for the crime itself. 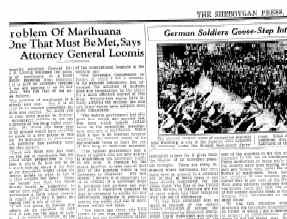 The files of the United States Bureau of Narcotics are full of cases which had their inception with the use of marihuana. “It has been estimated that as many as one-half of the violent crimes committed in certain distracts inhabited by Mexicans, Philippinos, Latin Americans and similar nationalities are attributed to the use of marihuana. The emotional temperament of these races has become completely unbalanced by the use of this drug. “A prosecuting attorney in New Orleans has asserted that 50 per cent of the murders in his city are traceable to the use of marihuana. Police authorities in many parts of the country have been dealing with men and Women who, under the influence of marihuana, have been law violators. It was recently estimated that 10 per cent of the New York state narcotic violations were marihuana cases and that 125 out of 450 arrests recently made in New Orleans were attributable to this same cause. “It was this situation which prompted the Interstate Commission on Crime, of which I am a member, to prepare and administrative program to aid the states that they might co-operate with the federal government and thus stop the illegal use of marihuana. Much valuable work is now being carried on by this Commission. Other organizations interested in social welfare have likewise become interested. Service clubs, the American Legion, Parent-Teachers Association, and other similar organizations, are seeking to do their part in disseminating the facts concerning marihuana and its narcotic effects. They feel that it should no longer be our policy to shroud this drug in mystery. They feel that parents should be alive to the possibility that it may find its way to their children’s schools and their recreation centers. Such enlightenment of the citizenry, they feel, is the most effective weapon in stamping out this new problem which rears its ugly head to further increase our serious problem of crime. “The indications are that the marihuana problem in Wisconsin is by no means a major one, but close scrutiny is advisable to prevent it from becoming a serious menace. Though the co-operation of law enforcing agencies, the necessary legislation, and the assistance of public-spirited citizens, we should be able to meet this problem.